Robert Whittaker’s management team is reporting that the UFC’s middleweight champ still wanted to fight Kelvin Gastelum yesterday, despite having been diagnosed with a hernia that required immediate surgery. 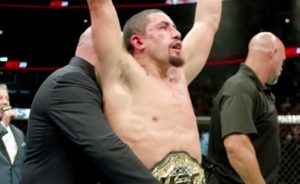 Whittaker had been scheduled to face Gastelum in the main event of UFC 234, which took place in Melbourne, Australia. Since the champion’s withdrawal and surgery, his management team shared out the statement below.